The words low-carb and Italian don’t necessarily sound like they should be said together, at least in my mind. 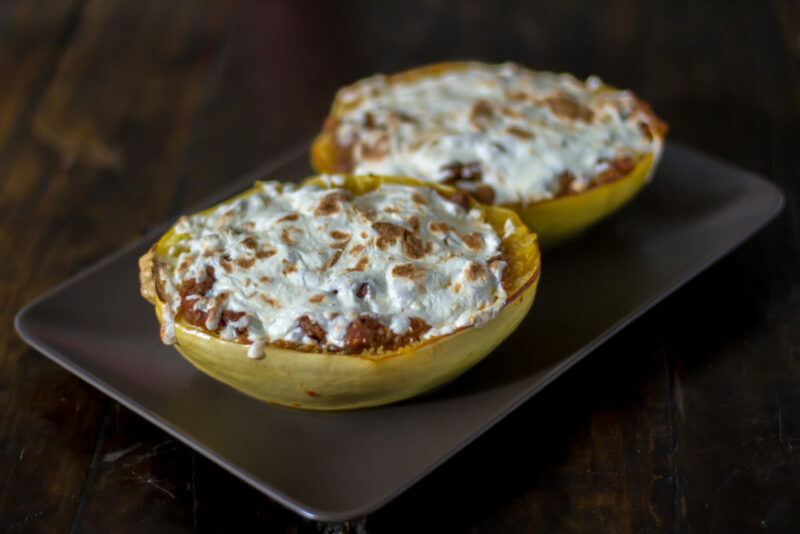 This time, however, spaghetti squash loaded with roasted garlic and fennel sausage, will give you all the Italian flavor you want in a low-carb package. Preheat oven to 350° Fahrenheit. Line a rimmed baking sheet with foil. Cut the spaghetti squash in half lengthwise. Scoop out seeds and discard. Rub one teaspoon of olive oil over each half and place cut-side down on the baking sheet. While the squash roasts, place a large sauté pan over medium-high heat. Remove the casings from the sausage and add to the hot pan. Sauté until browned and fully cooked. Add the diced onion to the pan and sauté until translucent. Add the tomato sauce and bring to a gentle simmer. Turn the heat to low, periodically stirring ingredients around the pan so they don’t burn. When the squash is done roasting, remove from oven and let cool about 10 minutes, until it’s cool enough to handle. Keep the oven on, but turn up the heat to 425° Fahrenheit. Using a fork, carefully scrape the flesh of the squash from side to side until it resembles spaghetti. Don’t pierce or damage the skin. Add the shredded squash to the sausage mixture. Season with salt and pepper to taste. Stir to combine and remove from heat. Place each hollowed out spaghetti squash skin back onto the baking sheet. Fill each shell with the sausage mixture, slightly mounded in the center. Top each filled half with 1/8 cup of the shredded smoked mozzarella. Turn oven to broil and broil squash until the cheese is brown and bubbly, just a few minutes.